Amitav Ghosh is an Indian author, best know for his works like The Shadow Lines, Sea of Poppies, The Glass Palace, and The Hungry Tide. 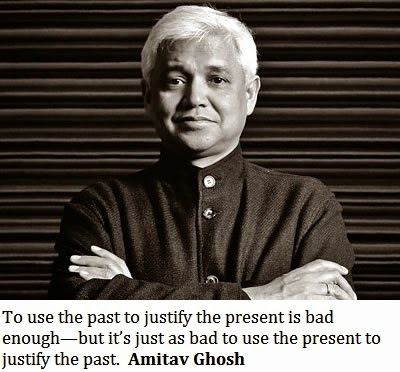 Here I have compiled down some of the best Amitav Ghosh quotes for your brain hunger. How do you lose a word? Does it vanish into your memory, like an old toy in a cupboard, and lie hidden in the cobwebs and dust, waiting to be cleaned out or rediscovered? I know nothing of this silence except that it lies outside the reach of my intelligence, beyond words - that is why this silence must win, must inevitably defeat me, because it is not a presence at all. If the charter of your liberties entails death and despair for untold multitudes, then it is nothing but a license for slaughter. That state, love, is so utterly alien to that other idea without which we cannot live as human beings --- the idea of justice. It is only because love is so profoundly the enemy of justice that our minds, shrinking in horor from its true nature, try to tame it by uniting it with its opposite [...] in the hope that if we apply all the metaphors of normality, that if we heap them high enough, we shall, in the end, be able to approximate that state metaphorically. The government to you is what God is to agnostics--only to be invoked when your own well being is at stake. There is something strikingly different about the quality of photographs of that time. It has nothing to do with age or colour, or the feel of paper. . . . In modern family photographs the camera pretends to circulate like a friend, clicking its shutters at those moments when its subjects have disarranged themselves to present to it those postures which they would like to think of as informal. But in pictures of that time, the camera is still a public and alien eye, faced with which people feel bound either to challenge the intrusion by striking postures of defiant hilarity, or else to compose their faces, and straighten their shoulders, not always formally, but usually with just that hint of stiffness which suggests a public face. To use the past to justify the present is bad enough—but it’s just as bad to use the present to justify the past. What would it be like if I had something to defend - a home, a country, a family - and I found myself attacked by these ghostly men, these trusting boys? How do you fight an enemy who fights with neither enmity nor anger but in submission to orders from superiors, without protest and without conscience?